The Grumman X-29 was an experimental aircraft that tested a forward-swept wing, canard control surfaces, and other novel aircraft technologies. The aerodynamic instability of this arrangement increased agility but required the use of computerized fly-by-wire control. Composite materials were used to control the aeroelastic divergent twisting experienced by forward-swept wings, also reducing the weight. 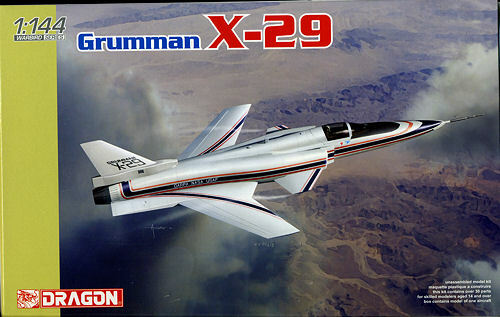 Developed by Grumman, the X-29 first flew in 1984 and two X-29s were flight tested over the next decade. 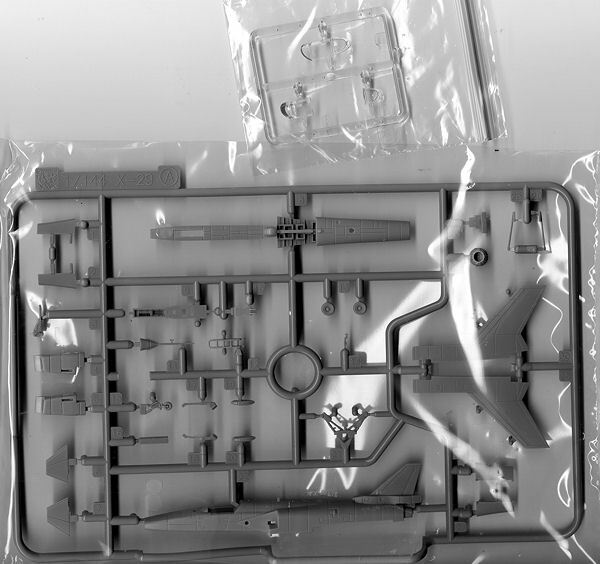 Many off the shelf components were used including the nose section of the F-5 and the main landing gear of the F-16. The reference states it was the first jet powered forward swept plane to fly since the Ju-287, totally ignoring the HFB-230 Hansa Jet biz-jet that was operated by the Luftwaffe and others. This neat new kit from Dragon is contained on two sprues; one clear and the other a standard grey plastic. The engraved detailing is nicely done though a touch much for the scale, but there you have it. The entire upper fuselage is molded as a single piece so you only have to add the lower fuselage insert for a complete fuselage. The wings and canards fit into large slots in the fuselage. Attachment points for the gear and gear doors are quite large. One can build the kit with the gear up if that is desired, though no display stand is provided. About the only other option is to have the canopy open or closed. A boarding ladder is provided for the open option. The cockpit is nicely done for the scale and has room for a bang seat and a control stick. The tub includes the nose gear well and this slots into the lower fuselage insert. Instructions are a single half-sheet with the three construction steps and parts layout on one side with a color chart and multiple warnings on the other. The back of the box has the markings placement guide. No information on wheel well or cockpit/seat color is provided, but there are a ton of Internet photos of the plane so that will not be an issue. Markings are for one of the two prototypes and should be easy enough to apply. This is seriously a weekend kit. Since most of the plane is to be painted gloss white (aside from the cockpit), you can have it together in a few hours and paint it in one day. 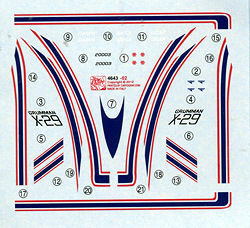 Then apply decals the next and you are done. A very nice addition to Dragon's small scale aircraft and X-plane collection.